A couple weeks ago, New England on the Fly's Ben Carmichael sent me a heads up about an upcoming event. I checked my calendar to make sure I don't have a gig on the evening of April 26. I do not, so I immediately purchased a ticket online. Some friends and I have causally talked about having a meet up of local Atlantic salmon anglers. Evidentially, we are not good enough organizers to make such a thing happen. Thank goodness guys like Ben Carmichael are! Ben mentioned that it will be a way to get hopeful and inexperienced Atlantic salmon anglers in the same room with experienced salmon anglers. Recently, while I was talking with a friend of mine who is a very experienced fly fisherman, but new to Atlantic salmon fishing, we talked about conversations that happen between Atlantic salmon anglers. I mentioned how I noticed how Atlantic salmon fishers have their own unique "dialect" within the larger language of fly fishing. When salmon anglers get talking amongst a larger group of fly anglers, it doesn't take long before the Atlantic salmon guys and gals begin speaking in what sounds like a sort of "code" to everyone else. It can be hard to follow for those who have yet to participate in this branch of the sport. 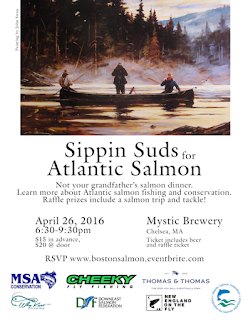 The way I see it, Sippin' Suds for Atlantic Salmon is an event that was created to break down such walls. I have plenty of salmon fishing friends my age and younger, but most don't live in the U.S. Most of my American salmon fishing friends are older than I am. A lot of American anglers consider the Atlantic out-of-reach, either financially, in terms of proximity, or otherwise. Nothing could be further from the truth. An event such as this allows connections to be made and information to be passed along to the next generation of Atlantic salmon anglers. Let's face it, the Atlantic salmon needs as many advocates it can get. If you are free, I encourage you to attend this event. I am very much looking forward to it. If you happen to go, I look forward to meeting you and talking salmon.